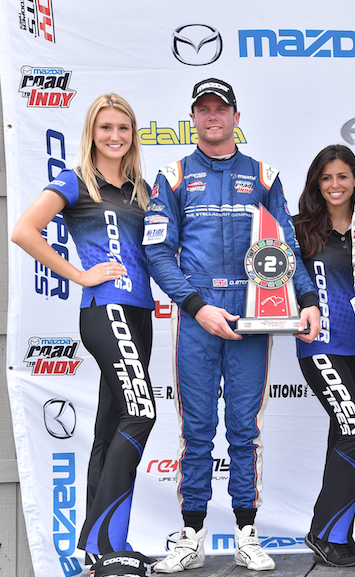 Race 2 – Indy Lights Presented by Cooper Tires, Mid Ohio, USA, 30th July 2016 Dean Stoneman reconfirmed his place as serious contender for this year’s Indy Lights Championship by finishing 2nd and so securing his second podium of the weekend in Ohio. The Rookie, who is racing in the IndyCar feeder series at tracks in the US for the first time impressed again from the start with a steely display of ruthless overtaking to get himself up to 3rd as early as the first lap. After the disappointment of race two in Toronto, when his car failed to start due to a still unknown fuel issue, Stoneman was again eager to boost his championship hopes with a good race… and it showed. The 26 year old kept the pressure on the second placed car and tried to reduce the gap, never allowing it to be more than one and half seconds and keeping him well within his sights. As the race went on the pressure was starting to show on championship rival Serralles as both he and Stoneman pushed to chase the lead car. Then, three quarters through the 38-lap race Serralles lost control gifting 2nd place to the pacey Andretti driver. Despite some pressure from the 3rd placed car towards the end of the race, Stoneman’s second place was never really under threat. The championship takes a month break, with the next round being at the famous Watkins Glen in New York State 2-4 September. In the meantime, he is now just 25 points off the championship lead with three races to go. Dean will also have a chance to impress with a IndyCar test with Andretti on 11thAugust, again at Watkins Glen, where he will hope to impress both IndyCar and the Andretti Team.